Scientists who want to obtain detailed structures of biological molecules now have a new facility to turn to: the cryo-electron microscopy (cryo-EM) service platform at EMBL Heidelberg. The platform enables scientists from other institutions to access state-of-the-art cryo-EM microscopes for high-resolution data collection. 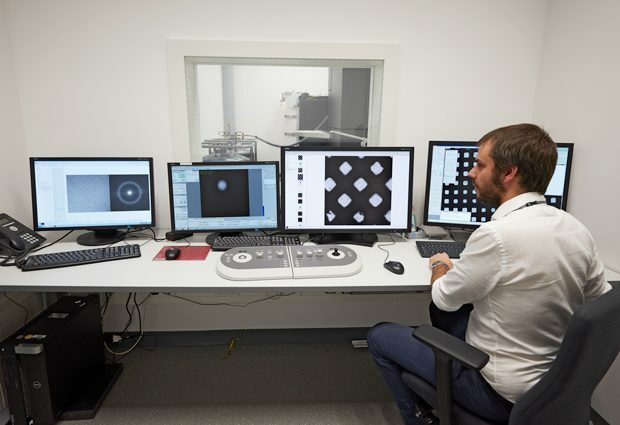 And experts are on hand to support researchers with everything from handling the microscopes to acquiring data at the highest possible resolution. At a user symposium earlier this month, scientists who have run their projects on the platform praised the quality of the results they obtained, and emphasised the outstanding, tailored support they received from specialists Wim Hagen and Felix Weis. Researchers can apply to use the cryo-EM service through the iNext programme, or, for a more tailored data collection strategy, they can apply to the platform directly.